I love things like hummus or avocado on (gluten-free) toast with eggs in the morning for that lovely little sweet/savoury punch they give. That being said, with a histamine intolerance and a bit of a FODMAP problem (it’s complex! ), I don’t indulge in those too often. Mostly when I’m out for breakfast at a cafe with herbal anti-histamines in hand. I still love savoury toast toppings when I’m home though, but I do try to keep the histamine load down if for no other reason than my own sniffling and itching drives me insane! Enter roast pumpkin…. Roast pumpkin anything is the absolute bees-knees in my eyes. I’d eat it at any time of the day to be honest, I’m really not fussed. 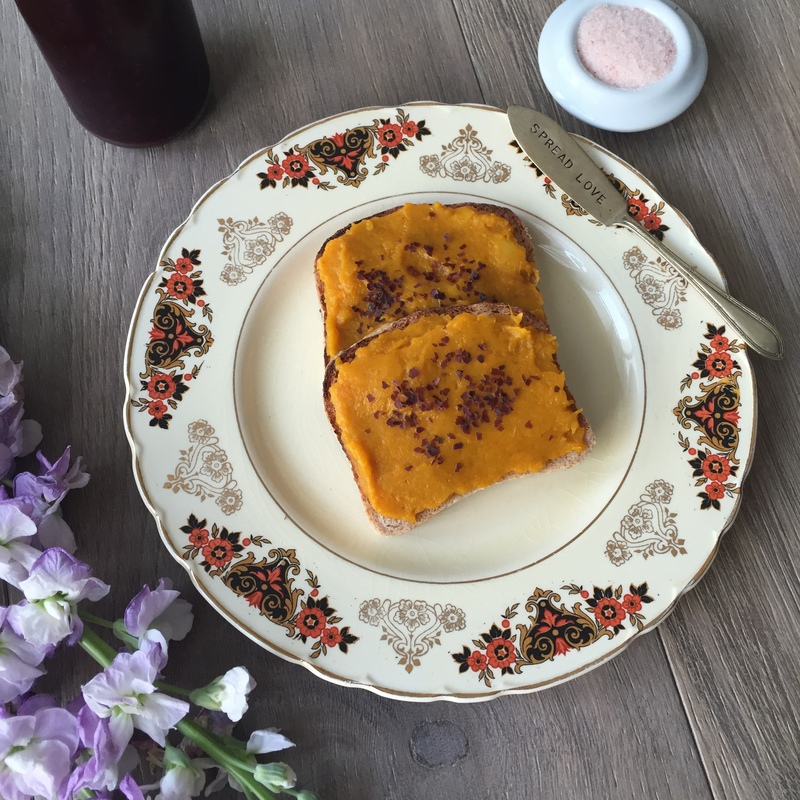 Pumpkin definitely ticks the low histamine box (phew!) and jap pumpkin also ticks the low FODMAP box so needless to say we go through quite a lot of it in our household. And why not, it’s a rich source of vitamin A and also contains vitamins C and some E (although more in the seeds) along with many B vitamins. Small amounts of iron, magnesium and manganese are squished in there too, so you see… nutrition powerhouse! Add to that the antioxidants in olive oil and cumin and you’re off to a good start for the day. When re-thinking the breakfast options pumpkin was always going to feature. We pretty much always have this little concoction in the fridge now and if it’s not getting spread on something I’m just eating it by the spoonful. I’m easily pleased 🙂 I might just mention it doubles as a fabulous pasta sauce too! It’s great on zoodles or Olive Green Organics Quinoa and Rice Spaghetti. So, yum. A note on cooking with olive oil: This seems to be a very controversial topic, but the International Olive Council(1) says olive oil can be heated as high as 210°C with no ill effects to health. It is the natural antioxidants present in olive oil that are considered the reason it may be protected against thermal oxidation(2) (a process that promotes the creation of free radicals that can cause disease), so I for one have never stopped cooking with it. International Olive Council 2015, Frying with olive oil, The Olive World, viewed 2 October 2015. Foster, R, Williamson, CS & Lunn, J 2009, ‘Culinary Oils and their health effects’, Nutrition Bulletin, vol. 34, no. 1, pp. 4–47, viewed 30 September 2015. Yum! What a great recipe and not just for the fall! I could serve this at my next dinner party!